“As a first-response agency, it is imperative that our chain of command sees what the SkyRanger sees, without delay," said Mark Fairclough, Station Manager, GMFRS. 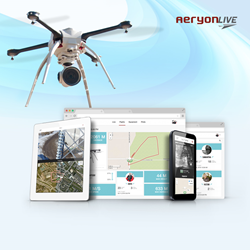 Aeryon, the leader in small unmanned aerial systems (UAS) for commercial, public safety and military applications worldwide, today introduced AeryonLive, an integrated Software-as-a-Service (SaaS) platform for enterprise UAS deployments. Comprised of complementary web-based solutions – AeryonLive Video and Telemetry, and AeryonLive Fleet Management – the platform will evolve to offer additional capabilities throughout 2016. Aeryon is bringing this multifaceted SaaS solution to market to enable more scalable and efficient UAS deployments in commercial and public safety segments. AeryonLive ensures the right information gets to the right people, at the right time, to enable prompt and accurate decision making – especially for large, geographically-dispersed fleets. “As a first-response agency, it is imperative that our chain of command sees what the SkyRanger sees, without delay. Watching the live video as well as telemetry gives everyone involved the critical data that’s needed when responding to incidents. In the three months of trialing AeryonLive, it has become an indispensable asset to our UAS operations.” said Mark Fairclough, Station Manager, Greater Manchester Fire and Rescue Service. This week, Aeryon will be showcasing AeryonLive at its booth #2313 during AUVSI’s Xponential 2016, in New Orleans and WREX 2016 in Orlando. Scheduled demos will include live feeds from four different countries.